So many new things are initiated with the idea that moving forward with baby steps is good! Baby steps will eventually get us there. The thing about babies is that they eventually grow up and take bigger steps. They get where they are going because they have evolved into a fully-functioning adult human. They take normal steps and have learned to leap when necessary. In the early stages of development, baby steps can be a good start for some people to start moving forward. 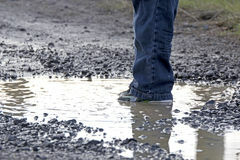 If a person only ever takes baby steps, he will be left far behind and perhaps standing in a puddle.